Download full-size JPEG (409K) or GIF (268K) image. 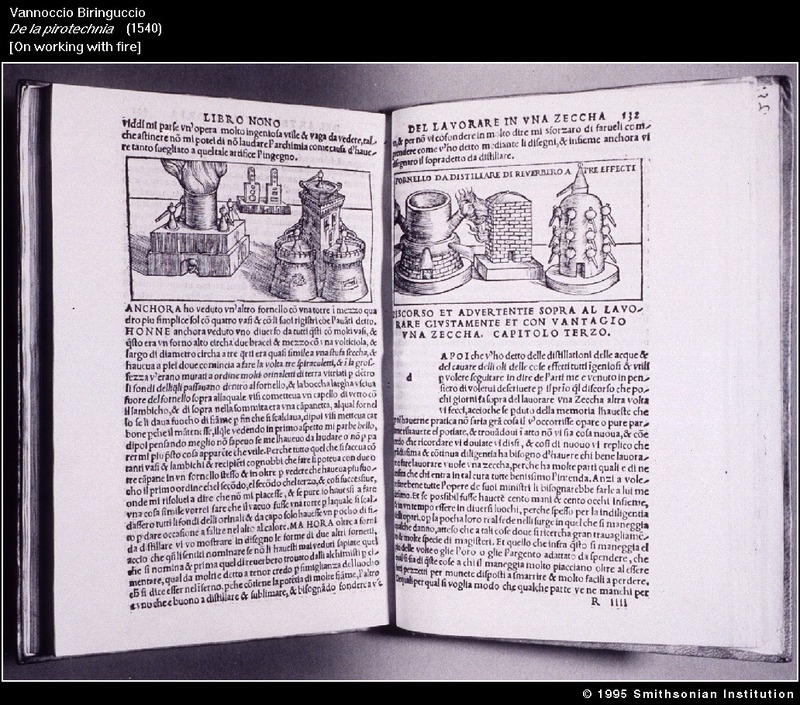 Intended as a practical guide to the "pyrotechnical arts" for those who work with fire, heat, minerals, and volatile substances, Biringuccio's book explains the different processes employed in refining metals, distilling liquids, creating glass, and mixing gunpowder. 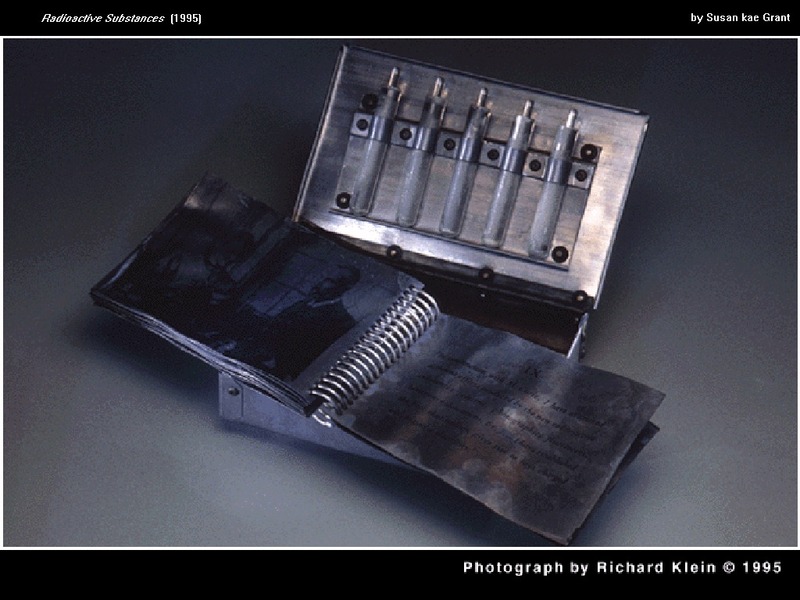 The pages on display here illustrate how furnaces are used to refine metals for the making of coins. Download full-size JPEG (167K) or GIF (127K) image. 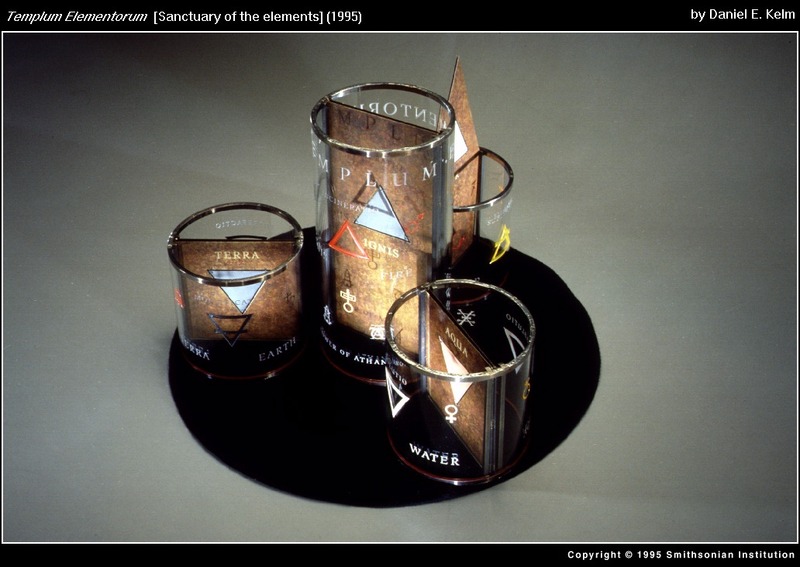 Glass cylinders in Daniel E. Kelm's book sculpture represent Biringuccio's furnaces, one for each of the "elements" known to ancient science--fire, air, water, and earth. Linking art and science is a favorite theme for Kelm, who spent five years teaching chemistry at the University of Minnesota before leaving to follow an artistic career. Download full-size JPEG (182K) or GIF (177K) image. Marie Curie's early research on radium led her to develop applications for radioactivity in medical therapy. 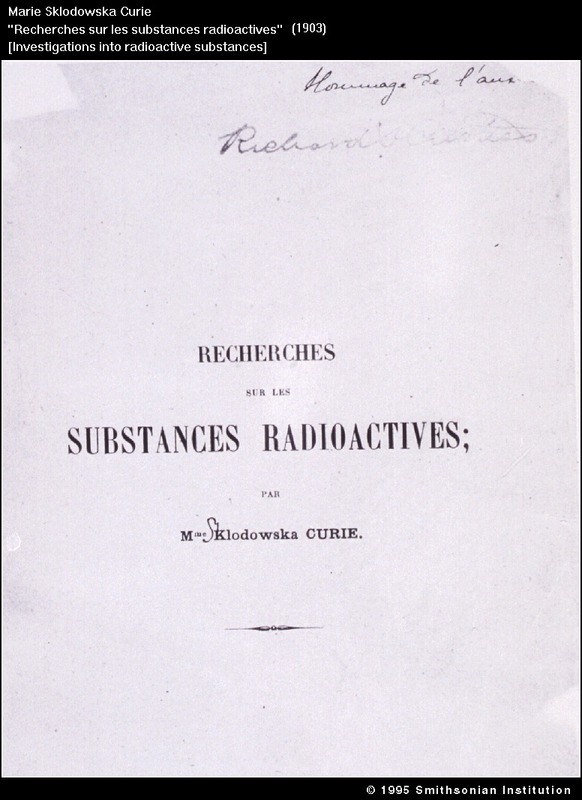 Her dissertation on radioactive substances--based on research she did with her husband, Pierre Curie, and her mentor, Henri Becquerel--was published as this 1903 article in a French scientific journal. The first scientist to win the Nobel Prize twice (1903 and 1911), Madame Curie attained honors beyond the dreams of most women of her time. She inscribed this copy of her article "hommage de l'auteur" [gift of the author], in the top right-hand corner. Download full-size JPEG (187K) or GIF (150K) image. For Susan kae Grant, the work of Marie Curie, the only woman scientist included in this selection, represents several important issues. Through details of Curie's life and research, Grant addresses topics such as women's changing roles in science and the physical and environmental dangers of dealing with certain natural substances. Curie's exposure to radium contributed eventually to her death.